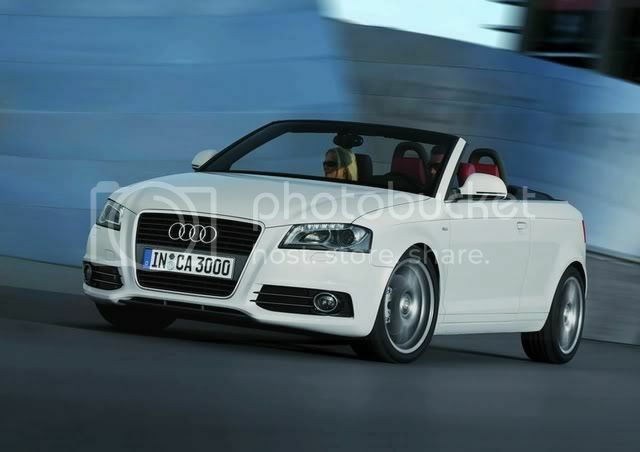 Sporty, elegant, emotion-packed – the new Audi A3 Cabriolet is making its appearance in perfect time for spring 2008. The open-top Audi A3 is the premium option in the compact class. It offers the sporting genes of the A3 coupled with the uncompromising quality that distinguishes every Audi model. There are four engines to choose from, together with an extensive range of individual equipment options. Sales commence in Germany at the start of February 2008. Audi convertible models generally sport a classic fabric top – and in the case of the Audi A3 Cabriolet this feature lends its profile a note of harmonious elegance and coupé-like sportiness. Its soft top is notable for its light weight and excellent fit. It can be opened hydraulically in just nine seconds; when open, it takes up very little space. The hood is available in semi-automatic and fully automatic versions, in the latter instance as a specially soundproofed acoustic hood. The body structure of this premium convertible from Audi contains a high proportion of high-strength, ultra-high-strength and hot-formed steels, as well as a large number of reinforcing measures that provide maximum rigidity and crash safety. Inside, the accustomed uncompromising build quality, attractive design and exemplary ergonomics create an atmosphere of sporting elegance. There is ample space here for four occupants. The rear seat backs can be folded down, increasing the luggage capacity from 260 to 674 litres – whether the hood is up or down! 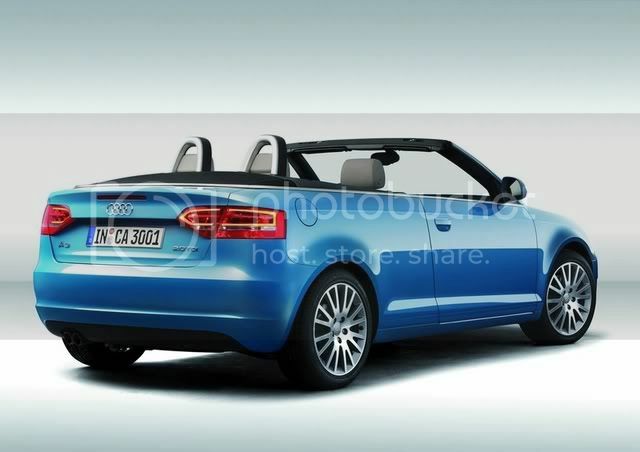 The A3 Cabriolet is being built in four engine versions – two petrol and two TDI. They combine ample power with impressive efficiency. All of them are direct injection units with turbocharging. The performance range extends from 77 kW (105 bhp) to 147 kW (200 bhp). As an option, the innovative S tronic dual-clutch gearbox takes charge of applying the engine's power to the wheels. 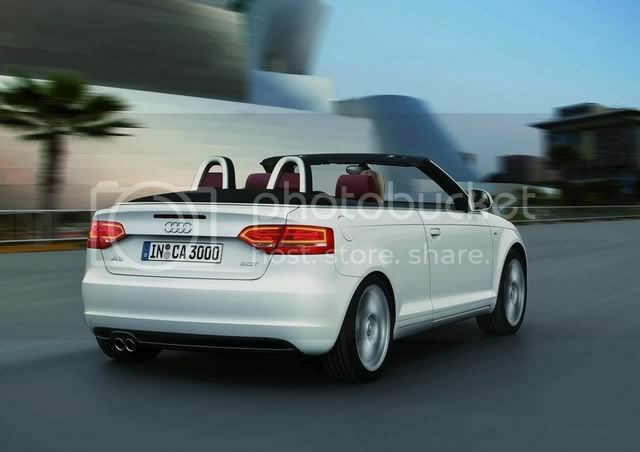 Audi is offering the Audi A3 Cabriolet in the Attraction and Ambition equipment lines. In both cases its equipment specification is extensive and the Ambition line includes 17-inch aluminium wheels, sports suspension and sports seats, among other features. An S line exterior package and S line sports package are available from quattro GmbH. There are many arguments in favour of the classic soft top as featured on Audi convertible models. One of them is evident at first sight: the harmonious proportions. 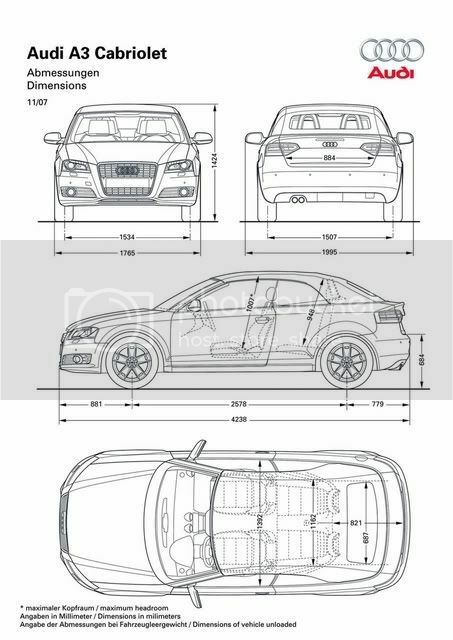 Thanks to the hood's compact folding design, Audi's designers were able to create a four-seater with appealing lines. With the roof open, the Audi A3 Cabriolet looks compact and light; with the roof closed, it radiates the elegance of a coupé. Measuring 4,238 millimetres in length, 1,765 mm in width and 1,424 mm in height, it ranks among the sporty compact models in its competitive field.The strong presence of the A3 Cabriolet is typical of the Audi brand. The interplay between its surfaces lends the body the character of a sculpture; these lines are framed by the forward urge of its lines. The horizontal dynamic line above the sill and the ascending shoulder line create the impression of a more elongated body. The face of the A3 Cabriolet is dominated by the large single-frame grille, but the headlights are also an eye-catching feature. The precision of their design gives visible expression to the perfectionism of the brand with the four rings. They can be supplied optionally with xenon plus lights, which can operate in tandem with the dynamic adaptive light technology. The "wing" – a chrome vapour-coated wing-shaped contour – has become established as a characteristic Audi element; its form varies depending on the type of headlight. The daytime running lights in the form of an integral light strip – an important safety feature at Audi – comprise seven white light-emitting diodes in conjunction with the xenon plus units. Similarly to the headlights, the rear lights of the A3 Cabriolet are of a flat, broad design. Their technology is based on fibre optic rods, but the visual effect is of two radiant rings that clearly distinguish the car as an Audi even after dark. When viewed side-on, the athletic physique of the Audi A3 Cabriolet is clearly in evidence. The striking wheel arches accommodate large wheels: in the case of the Attraction equipment line, 16 inches in diameter. The Ambition version has 17-inch wheels made from cast aluminium. 18-inch wheels from quattro GmbH are available as an option. Audi supplies the A3 Cabriolet in 15 paint colours that can be combined with three hood colours – black, blue and red. Audi has remained faithful to its successful line: the new A3 Cabriolet likewise has a classic fabric top. This blends in perfectly with the original, authentic idea of open-top driving and the feeling of carefree agility. The hood keeps its shape thanks to the mechanically moved metal linkage, which assures an excellent close fit, perfect tightness and the silhouette of a coupé. A large, heated glass rear window affords a good view to the rear. 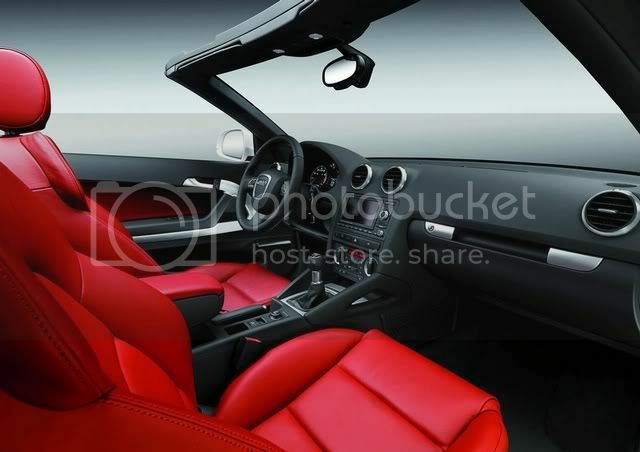 Audi can supply the fabric top in two versions – the semi-automatic soft top and the fully automatic acoustic hood. In both cases the hood is moved by a high-pressure pump with two hydraulic cylinders. They open the large soft top in an extremely rapid nine seconds. This means that even a short stop at traffic lights is long enough to complete the process. When lowered, the hood is folded up in a Z-pattern so that it takes up a minimum amount of space. The header – a board at its front edge – comes to rest on top, basically flush with the body, with the result that the structure needs neither a tonneau cover nor a cover flap. The folded hood is set down in a compact sheet steel compartment that reduces the luggage compartment capacity only very slightly. The high-performance kinematics mean that the acoustic hood can also be opened and closed at speeds of up to 30 km/h – a big advantage in terms of convenience when driving in urban traffic. The process is controlled by a switch on the centre console; the hood can also be opened and closed conveniently from outside the car, via the ignition key in the door lock. The fully automatic soft top takes the form of an acoustic hood. Between the outer skin and the inner lining there is a synthetic fibre mat that further improves thermal insulation and soundproofing – at a speed of 140 km/h it is only 1 dB (A) louder inside the Audi A3 Cabriolet than in the A3. If only the front seats are occupied, a wind deflector can be erected above the rear bench seat in a few simple steps from one side of the vehicle. An extensive package of measures gives the body of the A3 Cabriolet its rigidity, and this open-top Audi drives with the same standards of precision, agility and comfort as the A3 with permanent roof. 45 percent of the bodyshell is made from high-strength steels, while nine percent in fact consists of ultra-high-strength steels, combining low weight with maximum rigidity. The roof frame and roll-over bar incorporate hot-formed steels for maximum safety. Reinforcing profiles are integrated into the side sills and vehicle floor. V-pattern steel profiles additionally reinforce the forward structure and rear end, and there is a capsule with another reinforcing frame beneath the engine compartment. There are high-strength panels in the B-posts. A box-shaped structure made from high-strength sheet steel separates the passenger compartment from the luggage compartment. The roll-over bars of hot-formed steel tubing are bolted into this structure. Similar high-tech tubes serve to reinforce the A-posts internally. Head/thorax side airbags are integrated into the backs of the front seats. In the event of a rear-end collision, the Audi integrated head restraint system promptly cushions the head and upper body. The interior of the Audi A3 Cabriolet radiates an air of sporting elegance; its materials, Audi's accustomed uncompromising build quality and its design accentuate the premium character of this new convertible model. Calm lines border its large surfaces. The four round air vents and the side knee cushions on the centre console's struts are reminiscent of the Audi TT. It is a matter of honour for Audi to maintain the perfect standards of ergonomics that it has pioneered. The speedometer and rev counter's red needles sweep across dials in a sporty black. On the Ambition equipment line, the A3 Cabriolet is supplied with a three-spoke leather sports steering wheel. Multifunction keys are available as an option, and the S tronic transmission features shift paddles. The switches adopt an organic, ergonomic design. The two navigation systems available use an operating logic adopted from the superior MMI concept as familiar from Audi's large car lines. Audi offers a broad range of options for the seats. On the Ambition line, both front seats are sportily contoured. An electric four-way lumbar support is available as an option, as is heating for the front seats or all four seats. The classic convertible character that the fabric top creates in the open-top A3 can also be detected in the way the interior space is used. The windscreen is as upright as on the A3 with permanent roof, creating an unobstructed, airy impression of openness – unlike many competitor concepts with a steel roof, where the windscreen lies flatter. Because the folded hood occupies little space, it has not been necessary to move the rear bench seat further forward. This leaves ample legroom at the rear, thanks in part to the long wheelbase of 2,578 millimetres.Another of the Audi A3 Cabriolet's major strengths in everyday use is its variable luggage compartment. The rear seat backs, split 50:50, can be released from the luggage compartment. The wide, high through-loading space that is created increases the luggage capacity to 674 litres and the load area length to 150 centimetres – ample even for large items of sports equipment. In the standard arrangement the luggage compartment has an ample capacity of 260 litres, whether the hood is open or closed. The A3 Cabriolet is being built in four four-cylinder engine versions, two of them petrol and two diesels. All of them are turbocharged direct injection engines – their designations TFSI and TDI embody technological combinations that blend impressive output with high efficiency. TFSI technology demonstrated its potential over many years in the realm of motor sport – the sports prototype R8 won the Le Mans 24 Hours five times between 2000 and 2005. The Audi R10 TDI added to the string of successes in 2006 and 2007 with its immensely powerful V12 TDI.The new A3 Cabriolet is available with a choice of two TDI engines – a combination with which Audi already established a trend in 1995; back then, the 1.9 TDI became the first diesel engine in the world to be used for powering a convertible. In the A3 Cabriolet, the smaller of the two four-cylinder engines musters up an output of 77 kW (105 bhp) and a hefty 250 Nm of torque at just 1,900 rpm from a swept volume of 1,896 cm3. The speedometer needle takes 12.3 seconds to pass the 100 km/h mark, and the top speed is 185 km/h. This diesel version uses just 5.1 litres of fuel per 100 km. The A3 Cabriolet 1.9 TDI is available with a five-speed manual gearbox. The new 2.0 TDI with its displacement of 1968 cm3 displays the strengths of the TDI concept in an evolutionary interpretation – it runs efficiently, powerfully and very quietly. The four-valve engine, which is equipped with two balancing shafts, has been fitted with a newly developed common rail system. Its turbocharger has variable vanes for greater responsiveness and the pistons have acquired an optimised geometry that further enhances the efficiency of the combustion process. The two-litre engine develops 103 kW (140 bhp). Between 1,750 and 2,500 rpm it generates 320 Nm of torque – enough to accelerate the A3 Cabriolet from 0 to 100 km/h in 9.9 seconds and up to a top speed of 204 km/h. The 2.0 TDI is content to clock up 100 kilometres on an average of just 5.3 litres of fuel and its emissions already undercut the limits of the future Euro 5 standard. As an option, Audi can supply the high-tech S tronic transmission instead of the manual six-speed gearbox. The newly developed 1.8 TFSI produces 118 kW (160 bhp) and 250 Nm, the latter across an engine-speed range of 1,500 to 4,200 rpm. An adjustable intake camshaft optimises filling of its combustion chambers and two balancing shafts guarantee plenty of refinement. Direct injection and turbo technology is the ideal combination for abundant driving pleasure and impressive efficiency. The turbocharger responds extremely fast and the four-cylinder engine is spontaneous, fleet-footed, high-revving and torquey. It accelerates the A3 Cabriolet with six-speed manual gearbox to 100 km/h in 8.3 seconds and on to 218 km/h; it accomplishes the EU driving cycle on an average of 7.3 litres per 100 km. Alternatively Audi can supply the sporty S tronic. Technically speaking, the 1.8 TFSI is a very close relation of the 2.0 TFSI that was voted "Engine of the Year" three times in a row by an international panel of journalists. The two-litre version puts 280 Nm of torque onto the crankshaft from 1,800 to 5,000 rpm, and between 5,100 and 6,000 rpm it develops 147 kW (200 bhp). The 2.0 TFSI likewise operates with an adjustable intake camshaft and two balancing shafts, and its compression ratio of 10.5:1 guarantees high thermodynamic efficiency. With the S tronic dual-clutch gearbox that is available alongside the six-speed manual gearbox, the A3 Cabriolet 2.0 TFSI sprints from 0 to 100 km/h in 7.3 seconds; its top speed is 231 km/h. It uses on average 7.6 litres of fuel per 100 kilometres. The engine's power is directed to the front wheels on all versions of the Audi A3 Cabriolet; the engine versions from the 103 kW (140 bhp) upwards are fitted with a six-speed manual gearbox as standard. The S tronic combines the advantages of both automatic and manual transmission. At high loads and engine speeds, it shifts between its six gears in just 0.2 seconds without palpably interrupting the power flow. The driver can operate the S tronic by means of the one-touch lever or, in motor racing style, using the shift paddles on the steering wheel. There are furthermore two fully automatic modes available, D for Drive (standard) and S for Sport. The S tronic operates highly efficiently and its electronic management in the automatic mode ensures that the engine runs as economically as possible at low engine speeds. Even the most painstaking of drivers could not accomplish this better. The light, compact fabric top lowers the overall weight and the centre of gravity of the Audi A3 Cabriolet. This helps the Audi dynamic suspension to realise its full potential.Audi had recourse to a classic layout for the front suspension – a McPherson design with triangulated lower wishbones. The subframe on which the structure is mounted is made from aluminium. Bolted to the body, it imparts the forward structure with very high rigidity. The precise, firm-acting rack-and-pinion steering operates with electromechanical power assistance with speed-dependent control. The system does not use energy when the car is driving in a straight line, saving 0.2 litres of fuel per 100 kilometres on average. The four-link rear suspension represents another technical highlight. Its design principle brings major advantages in terms of handling characteristics because it registers and responds to longitudinal and lateral forces separately. Here again, a subframe connects the suspension with the body; compact coil springs and dampers provide vertical support. All these technologies are key ingredients of the overall impact made by this sporty convertible. It is infused with the precision and spontaneity that the car delivers with every turn of the steering. The open-top A3 is sprung with subtlety and its steering functions with unshakeable calm. The self-steering behaviour remains neutral right up to a very high handling limit. For the Ambition equipment line, the A3 Cabriolet is available optionally with sports suspension that lowers the body by 15 mm. The Attraction line comes with 16-inch wheels with size 205/55 tyres. On the Ambition, 17-inch aluminium wheels with size 225/45 tyres are standard. Audi can also supply four other wheel versions as options, as well as a tyre pressure monitoring system. The brake system of the A3 Cabriolet likewise satisfies sports standards. The front discs are ventilated and have a large diameter. The pedal feel is direct and spontaneous, and the braking power can be regulated with outstanding ease. Particular emphasis was placed on reducing the braking distance when the stabilisation program (ESP) was being fine-tuned. The Attraction line of the Audi A3 Cabriolet already comes with a semi-automatic hood. Four electric windows and the standard daytime running lights round off the specification. The sporty Ambition line has the distinguishing features of 17-inch aluminium wheels, front fog lights and sports suspension. Inside, the sumptuous equipment includes sports seats, a driver information system, a leather sports steering wheel, a wind deflector and special inlays, upholstery and door sill trims.The range of options for the A3 Cabriolet includes such convenient items as multifunction steering wheels, deluxe automatic air conditioning, leather upholstery, heated seats and a parking aid. Xenon plus headlights and the adaptive light for cornering illuminate the road effectively in the dark. The storage package for the interior and luggage compartment and a ski and snowboard bag further add to the practical utility of the A3 Cabriolet. Typically for Audi, the A3 Cabriolet too features a broad range of multimedia technologies. This extends from the chorus CD radio, with four speakers, to the Bose sound system. All audio systems from the concert radio upwards include an interface on the centre tunnel for connecting up an iPod or MP3 player. Two navigation systems – with monochrome or large colour monitor – help with providing directions. For mobile telephony, Audi offers a mobile phone preparation in combination with the audio systems.Those who are fond of very special features will appreciate the equipment lines on offer from quattro GmbH. The S line comprises an exterior package for the body and a sports package. A third option available from quattro GmbH is the Audi exclusive line.